Beautiful, bright and spacious apartment (1 ° floor, no elevator) with wifi, 2 satellite TVs with international channels (also TV Flanders) terrace with beautiful sea views. 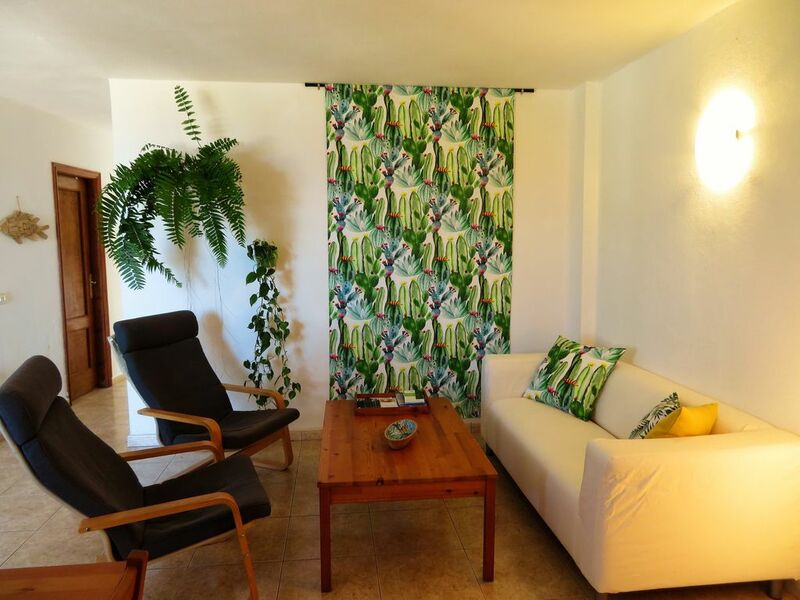 Located in the characteristic town of Tazacorte with its small cozy squares and narrow winding streets. Shops, banks and bus stop 5 minutes away, beach at walking distance. Tazacorte is a central base for all kinds of excursions. You are personally received by Jairo, who speaks Spanish and English. For a problem you can go to him. We had a great stay in this cute and comfortable apartment. The apartment is well situated in the town and is very well equipped. We especially enjoyed our time on the glassed-in balcony over-looking the town and the ocean. Beautiful view and spectacular sunsets. Jairo was especially helpful shuttling is to and fro from the airport, sharing information and bringing us on an excursion. It was very helpful to have someone who could speak English. The island is beautiful, with many things to see and do. The beach in Tazacorte is fabulous and the bus system on the island is convenient easy to use. All in all, a great stay. This apartment was clean and well presented. It was particularly well equipped with an ample supply of towels, bed linen and kitchen equipment. It was well located just a few minutes walk to supermarkets and restaurants and has ample on street parking. I was collected from the airport by a very friendly guy and shown around the flat. I also spoke to the owners who were both helpful and friendly. I have given it 4 stars because the sound of roosters can be a bit intrusive in the morning. Thank you Nigel for the nice review! We do everything to make comfortable for the customers and wish them a very nice stay on this beautyful island! And yes, it's true, it's not nice that the roosters wake you up. But I can say, like the other people of the village says, you get quickly used to it. You can, in the beginning, use the earplugs and close the windows at night. At least it's a natural noise, there is no industry or disco-noise, for the rest it's a very quiet area with very kind people. Nette moderne woning in een kalm stadje. Het is het eerste appartement waar er zoveel gerief aanwezig is handdoeken , keukengerei , alles is er ! Het uitzicht op het terras (zeezicht) is prachtig en zalig genieten id avondzon . De eigenares Bea is een heel vriendelijke dame, geeft goede info en volgt alles goed op👍👍 Ook Jairo die vlot engels spreekt kan je steeds bellen zo nodig .Het enige minpuntje zijn de vele hanen wat verderop ..een wekker heb je hier niet nodig .Maar het appartement heeft alles voor een mooie en leuke vakantie .Alles was echt super proper en er lag zelfs een fles water en wijn id koelkast bij aankomst toch wel een leuk welkomst geschenk na de vlucht . Ligging is goed, dichtbij de supermarkten apotheek , voor het strand kun je de wagen nemen of wandelen ..het is aangenaam verblijven in la alegria !! Great apartment. We will be back. The apartment is located in a residential area of Tazacorte. Shops, bars, restaurants are in walking distance; the beach can be reached by car in 5 mins. The apartment is equipped with all you need, even the binoculars are not missing. Great view from the balcony, there is no better place for a sundowner. There is a new urban swimming pool with indoor and outdoor pool, walking distance 10 minutes. Geen extra kosten meer. Inbegrepen in de prijs: onthaal, wifi, satelliet tv met internationale zenders, eindschoonmaak.